Time to celebrate the birth of a new generation - or rather, an out-of-control project of five friends. 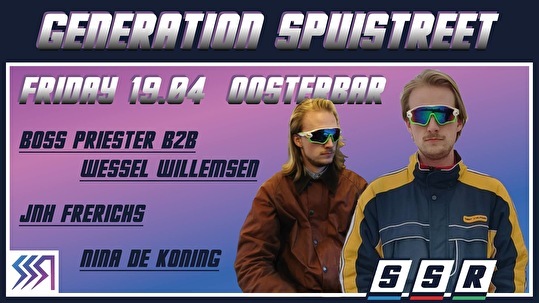 Experience the best of Spuistreet Records in the Oosterbar on the 19th of April. This basement, located next to Generator hostel, proves to be a very suitable location for our birth. Cozy, dark and humid, just like a womb. Come cut the proverbial umbilical cord! Festivities include bass-driven bangers and possibly some hanging upside down from the ceiling. It's going to be good, if you follow the rules.